A.M. and Florence Drake arrived in Central Oregon in June 1900. As they made their way through the homeland of the Northern Paiute tribes and alongside the Deschutes River in a covered wagon, the Drakes stopped to assess their surroundings and make camp. It is reported the couple butted heads over where to establish their homestead. Alexander (A.M.) wanted to settle further upriver, but Florence Drake preferred to build near their campsite. Mrs. Drake won the debate—and their log lodge would eventually overlook the river to the west, the current site of Bend’s Mirror Pond. 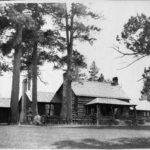 When Drake Lodge was constructed, the Ponderosa pines shading its eaves were almost 200 years old. The Drakes were drawn to Oregon by the 1894 Carey Act—a law that encouraged private enterprise and settlers to develop desert through building irrigation and infrastructure in desolate areas. When Alexander initiated his business—the Pilot Butte Development Company—he formally platted the City of Bend with the Drake Homestead at its nucleus. Drake purchased additional town-site acreage from William H. Staats. He also platted and sold many lots of what formed Bend’s downtown district. 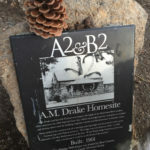 Although credited with establishing the city, the Drake family lived in Bend for a relatively short time—they moved to Pasadena, California, 11 years later. The Drake Homestead was sold to Chicago businessman Irving Stiles, who used it as his summer home. The Emblem Club of Bend assumed ownership from Stiles and converted it into a public gathering space. The Bend Masonic Order became the final owner. The organization used it for many years before constructing a new building in East Bend. When the Masons moved out, the lodge was torn down in 1956. Although several old growth Ponderosa pines near the lodge were lost when the structure was demolished, three remained, and are now approximately 300 hundred years old. It is these survivors that we honor. The Scottish botanist and plant explorer David Douglas proposed the name based on specimens he collected near the Spokane River in 1827. His name for the tree was published posthumously in 1836. Douglas’s collection introduced the species to British horticulture; of the three recognized varieties, two of them, var. Ponderosa (Pacific ponderosa pine) and var. 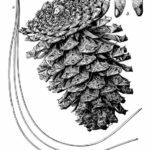 Scopulorum (Rocky Mountain Ponderosa pine), are found in Oregon. Before White settlement, many Native peoples used Ponderosas for shelter, building materials, firewood, and food. When the sap ran rich with sugar in the spring, they peeled the bark and ate the thin inner layer. Harvesting the inner bark was done with sharpened poles and, later, with steel axes or chisels. The resulting oval scars on the trees are unlike those made by fires, lightning strikes, or animals. The Cheyenne Indians of Montana applied Ponderosa pine pitch inside whistles and flutes to improve the instruments’ tone. The Nez Pierce used the pitch as torch fuel, and the Crow used pitch as glue. It was also used by some tribes to produce a blue dye. Ponderosa pines are hardy and fire resistant. They are somewhat self-pruning, meaning that as they grow, they drop their lower branches. This helps ward against low-ladder fuel fires. They also develop a very thick bark—up to four inches thick on old trees. This too, helps them survive wildfires. Ponderosas can live to be between 300 and 400 years old and grow to an average height of 165 feet. The tallest recorded pine tree in the world is a Ponderosa pine in the Siskiyou National Forest in Southern Oregon. It measures 268 feet high!